Neaton employees poss for pictures following the tree planting service held on Friday, June 5 at the Neaton Plant in Eaton. Cherry Blossom are tradtional sign of friendship between the United States and Japan. Executive Vice President of Neaton David Gulling pours dirt into one of the trees at the cherry blossom tree planting hosted at Neaton on Friday, June 5, in Eaton. The trees are a traditional representation of friendship between Japan and the United States. 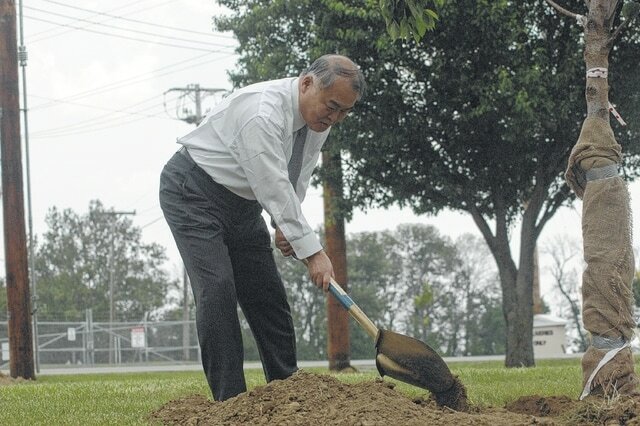 Makoto Hirose, the son of the founder and currentNeaton chairman of the board, participates in the tree planting ceremony held at the Neaton Auto Parts plant in Eaton, on Friday, June 5. The planting of the trees is a traditional sign of friendship between Japan and the United States. The planting of the trees in Eaton are the start of a initiative to plant 1,000 trees in the Dayton area over the next several months. EATON — In 1985, Neaton Auto Products opened a 25,000 square foot factory in Eaton. Thirty years later, two plants spanning over 425,000 square feet host one of the largest employers in Preble County. On Friday June 6, the company hosted a 30-year celebration by holding a ceremonial planting of Sakura cherry trees in front of the main plant building. The trees represent a long standing tradition between Japan and the United States that dates back to 1912 and represents a gift to the city of Eaton, Dayton and the United States. According to a spokesman who spoke through a translator at the ceremony, the trees are a traditional and symbolic “thank you” gift to the United States and the people of Eaton who helped provide humanitarian aid to Japan after the 2011 tsunami. Citing the U.S. military aid operation that was titled “Yujin,” or “Friend,” the company was thanking those who provided aide for the people of Japan in the immediate aftermath of the tsunami. Over 1,000 trees will be planted in the Dayton area over the next four years as a thank you gifts for the aid, to both the U.S. government and the every day people who gave to aid efforts after the natural disaster. On Tuesday, June 9, the company will host another ceremonial planting where 30 more cherry blossom trees will be planted as a gift from the people of Japan to the city of Eaton, at Seven Mile Park. Neaton has made parts for Japanese’s automobile companies through out the company’s history that has allowed a strong relationship to build between not only the company and Japan but the city of Eaton and Japan. Gulling continued by saying the proximity to customers in 1985 was also key in choosing Eaton as a location since Honda was located in Marysville at the time. According to Gulling, the company makes a wide range of auto parts for Japanese auto companies at the plant, like Honda, Nissan and Toyota. Those parts include steering wheels, airbags and interior trim parts. Gulling said over the last 30 years the company has continued to grow and now hosts 1,100 associates who work at the Eaton facility making it one the largest employees in Preble County.